At Long Island Kitchen and Bath, We Take Pride in Our Work, Our Honesty, and Our Respect for Your Family and Home. 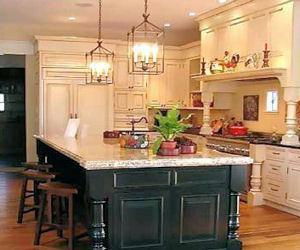 Our services include complete kitchen and bath design and installation, custom cabinetry layout and custom woodworking done in our own shop. We had them re-do our bathroom. They made a number of changes, and it's like a completely different room in there really, especially the shower, which is about a million times nicer now that it has the glass door and the awful curtain is gone. It is so much more pleasant. We replaced our kitchen counters and flooring, and this is one of the companies we contracted with. The finished job is magnificent. We can barely recognize our kitchen--it has become a much nicer place to be, and there is so much more space now! It has actually made cooking easier. One of our goals since we were just young newlyweds was to eventually have enough money to afford the perfect gourmet kitchen. It seemed like nothing more than a pipe dream for the first twenty years of our marriage, but this past year, it became possible at last! Long Island Kitchen & Bath was the company we chose to make our dream kitchen in our new LI home, and they could not have done a more fabulous job. The kitchen is beautiful, functional, intuitive, warm and inviting. Everything we ever have wanted. We both LOVE spending time in here cooking up a storm! LI Kitchen & Bath took care of my bathroom remodeling needs. I had a pretty clear vision of what I wanted before I hired them, and the first thing I did was sit down with them and explain what I was picturing. They told me it was do-able, and helped me find tiles and countertop which fit my parameters. After I chose what I wanted, they did all the installation work for me. Price tag was big, but that was expected. I have the bathroom of my dreams! I couldn't be happier with my new modern bath. Long Island Kitchen & Bath did a wonderful job getting rid of the old and giving me something I actually like. I am thrilled with my new kitchen. It's much more modern now that Long Island Kitchen & Bath has gotten a hold of it. The bathrooms are next! I am absolutely thrilled with my new kitchen from Long Island Kitchen and Bath. My kitchen didn't make use of the space that was available, and really needed a new design. With new cabinets, and new counter tops, rearranged my kitchen now utilizes all the space it can, and I am now much more organized. Great job! I am so happy with my new bath as well as the services that Long Island Kitchen and bath provided to me. They made the job look like child's play! Long Island Kitchen & Bath does it all ! I sound like an advert, but seriously, this is a wonderful company if you need to refurbish your kitchen or bath and you want some experts to come in and help you do a total makeover of your space. I never was satisfied with my kitchen; we have a beautiful LI house, but the kitchen always seemed dreary and since I spend a lot of time there, I wanted it to feel warm and inviting. LI Kitchen & Bath helped me overhaul the kitchen counters and replace them, add custom wood carving to my cabinets, and put in new tiles on the floor. They also installed lights in various key places which bring out the sheen of the tiles, countertop and wood, and which make the kitchen feel more inviting and warm. I am very happy with the job they have done. If my bathroom needed remodeling I'd contract with them in a heartbeat. I've recommended them to all my friends. Do you have any experience using Long Island Kitchen & Bath? If so, please rate your experience and let others hear about it using the form below.